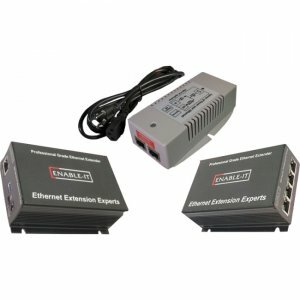 The Enable-IT™ 868 Pro Single-Line Ethernet Extender Kit is the world's only available solution to deliver Voice, Data and PoE in a combined package that exceeds the IEEE distance limitations for all Ethernet equipment and 802.3at PoE Plus. The 868 Pro enables the simple installation of a single IP PoE device up to 1,000ft (305m) From your LAN and Power Source. This is ideal for installing PoE IP Security cameras or PoE WiFi Access Points (9W max) or for a standalone remote self powered LAN up to 1,000ft (305m).